6 years ago, I was suffering from heavy stress and anxiety. I was having a hard time paying my bills and an even harder time figuring out what to do with my life. I felt like a failure, a screw up, and like most of my daily life was just one big fuzzy trudge through the mud. Then I found out I was going to be a dad. It was completely unexpected, but it took a few months before it really hit me. Once it did though, my stress and anxiety was amplified. I wanted nothing more than to be an example to my soon-to-be son, but I had absolutely nothing to show for it. Those two things, on top of everything else, collided to create a sort of restlessness in me that perpetuated constant stress and anxiety. I had to find an answer. What happened next was a long process of search and discovery, one thing leading to another before I finally landed on the answer. Of course, the answer wasn't what I thought it was (and at first I didn't like the answer), but I found it. I’ll get to that in a sec. We all think our situation is unique. We think our minds are crazy and chaotic and we can’t sit, let alone stop, and that there’s nothing we can do about it. Or, we’ve tried some things and nothing’s worked. Either way, we think it’s just how we are. The reality is though, this is a universal condition we all suffer from. “The monkey mind”, a term coined by the Buddha over 2,500 years ago, is a basic condition we experience simply from being human. "Rapid technological advances. Increased wealth. Stress. Stable lives and careers come under the pressure of accelerating change. The twentyfirst century? No, the sixth century b.c.—a time of destructive warfare, economic dislocation, and widespread disruption of established patterns of life, just like today. In conditions similar to ours, the Buddha discovered a path to lasting happiness. His discovery—a step-by-step method of mental training to achieve contentment—is as relevant today as ever." When I first read this it really surprised me. “So, the world the Buddha lived in isn’t all that much different from our own.” I thought. This, to me, is very enlightening. Buddhist wisdom tells us that just as there’s a central quality to all of our suffering, there’s a central cure for it as well. Stress and anxiety are no exceptions. The steps below are what worked for me personally, so know that I talk from direct experience. In The Little Book of Mindfulness, I talk briefly about the first aspect of meditation: samatha. If you haven’t read it yet I’d suggest doing so as it will give you much more information that will aid in your efforts. You can get it free (just an email is required) by clicking here. ...you can cultivate an extraordinary ever-present state of tranquility within you. “I can’t stop, I have so much to do." “I can’t handle this, I’m not capable." “They’re supposed to listen to me." “Why didn’t this happen the way I wanted!!" We’ve forgotten how to truly rest our body and mind and suffer greater stress as a result. By identifying these harmful patterns of behavior, we're halfway to cutting off the source of the stress altogether and experiencing the greatest relief. This sounds simple, but it's often difficult and takes time. Patience is very important from this point on, but you've gained considerable relief along with the other benefits of your meditation practice, so provided you continue practicing consistently you should have more than enough motivation to continue (most of the time at least). It’s also very important to be compassionate with yourself as you tend to face somewhat uncomfortable things about yourself at this point. 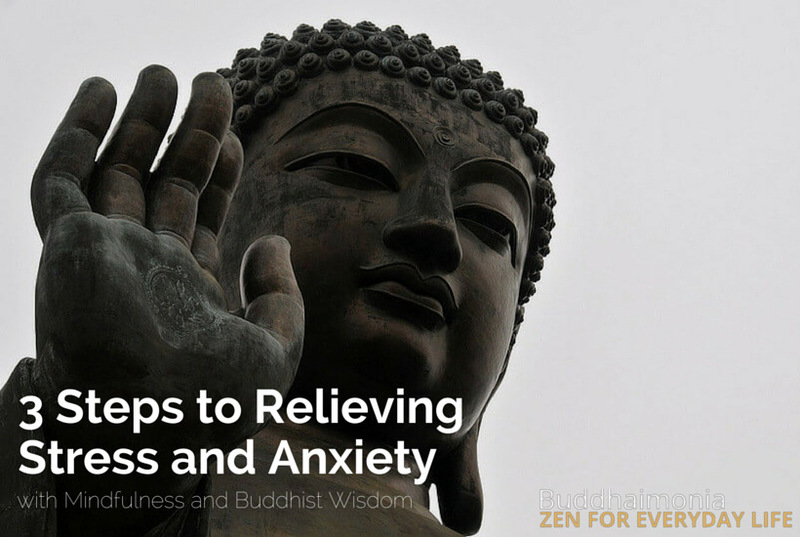 The truth is, daily stressors and the situations which cause you anxiety may never go away. Nearly every day, I’m confronted with challenges that test my patience. But just because those potential stressors exist doesn’t mean you have to be controlled by them. You can change your relationship with those stressors. By changing how you relate to them you can not only manage them better but with time you can cut off the source of the stress and anxiety altogether. Relief is possible if you let the light of mindfulness and the wisdom of samatha guide you.